The ongoing Schools Education programme has been set up in memory of John Jacob, a founder member and chairman of the Suffolk Craft Society. The program is intended to give young people the opportunity to be introduced to crafts under the guidance of professional makers. For this project the Suffolk Craft Society partnered up with EastFeast to deliver the schools education program. EastFeast are experienced at working in schools and by linking up with Suffolk Coast & Heaths and Dedham Vale & Stour Valley AONBs (area of outstanding natural beauty) it enabled us to take the project outside. Schools were selected that had links to the AONB areas and this offered the stimulus for the varied work done with the artists. 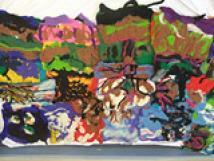 Jacky Linney, a textile artist, worked with all the pupils from Yoxford Primary School. They drew images of birds and other animals and plants that might be found in the AONB area, and then cut these out in preparation for screen printing. Pupils had never experienced screen-printing before, and were enthralled by the process. They have made two large banners with vibrant colours and striking images. Jenny Nutbeem worked with pupils from Kelsale using two different artforms. Firstly they made their own paper, and embedded leaves and grasses found within the school grounds into it, creating beautiful and highly original pieces. These have been made into beautiful books. 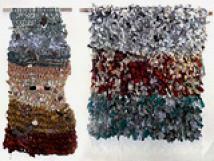 Jenny later worked with pupils on a textile project. They made sketches of trees, and then transferred these on to fabric, which they then turned into unique and individual cushion covers. Pupils from Nacton worked with two Suffolk Craft Society artists, Jonathan Keep and Jenny Nutbeem. This work has dovetailed with another project at the school, developing a wildlife area in preparation for the school’s centenary celebrations later in the summer term. Jonathan worked with younger pupils making insects found in the AONB out of clay, and finishing them with a vibrant blue glaze. Jenny has used a range of recycled materials to make large dragonflies with pupils; these will eventually be displayed in the wildlife garden. Pupils from Year 3 and 4 enjoyed printing and collage workshops with Val Armstrong. They visited a nearby wood and made sketches of the trees, leaves and other natural objects in the area, and then translated these into prints, using a range of different printing techniques. The children enjoyed using ‘professional’ printing inks with much more vibrant colours than ink usually used in schools. They later worked into their prints using a collage technique, each making their own finished piece. Jonathan Keep has worked with pupils at East Bergholt Primary School, making ceramic tiles for their outdoor classroom that will be part of their new wildlife garden. Pupils at East Bergholt are very aware of the varied flora and fauna found within the Dedham Vale AONB, and also made impressive stag beetles with Jonathan, from high-fired terracotta clay. Karen Risby, a local ceramicist from East Bergholt, worked with pupils from Tudor Primary, making animals, birds and trees that they might see in the AONB area. Some were real and some imaginary! Pupils worked with local artist, Katie Walker from Sudbury, who works with felt. The starting point was a section of woodland close to the school and within the heart of the Dedham Vale AONB. Pupils and staff took many photographs of the trees, and then used one as inspiration for their felt work. The tree landscape photo was divided into sections, and then having learned felting techniques pupils made a representation of their own part of the photo. Katie later joined sections together to make one large piece. The pupils’ work was shown at three exhibitions over the summer months, in Sudbury, Ipswich and Leiston. The exhibition at Leiston Long Shop Museum was very successful with a high number of visitors and an enthusiastic response to the work. Holding the exhibition at the Museum enabled parents from Yoxford and Kelsale in particular to visit the exhibition and see their children’s work. The Museum also laid on activities for children related to the exhibition. • A very beautiful and uplifting exhibition – well done to all those involved. • Fantastic exhibition, very imaginative children, keep up the good work. • What a lovely colourful and imaginative display! Congratulations to the children, the makers and the organisers. • It was wonderful to see the childrens’ work and to see their enjoyment and pride when they saw the exhibition. A valuable enterprise. • Beautiful bright and colourful – a lovely uplifting exhibition. Thank you. • What an exciting project to get involved in and how wonderful for the children to work alongside artists and together to create some beautiful pieces. I’m sure they will remember this with pride for a long time – deservedly so. • Very good to inspire children to make something and teach practical skills instead of TV. • Wow – fantastic, the variety and quality of the work is a real joy – I hope this becomes a regular event! • It is lovely to see the work of young and inspired school children creating. I hope that some will see their life can be magical without the modern day plastics. • Inspiring artwork. Lucky children to be exposed to this. Six schools from rural and urban areas along the Rivers Alde, Ore, Gipping and Orwell in Suffolk took part in this series of print based workshops. Working with members of the Suffolk Craft Society this was part of a larger Ebb and Flow project initiated by Suffolk Coastal District Council to celebrate and explore regional heritage and the natural landscape. The ‘Ebb and Flow’ project focused attention on the river environment and the changing natural habitat as it runs through town and country. The school children, aged from 4 to 18 years old, explored and learnt about their local environments, the history and the effect that they may have on it’s future. An exhibition of the project and final artworks toured Suffolk, with a celebratory ‘Ebb and Flow’ day at Snape Maltings, the New Wolsey Theatre in Ipswich and rural museums during the summer. The project was part of the ongoing Suffolk Craft Society John Jacob Young Marker’s Programme. It was a partnership between the Suffolk Craft Society, The Poetry Trust, Ipswich and Colchester Museum Service and Suffolk Coastal District Council. Artists and schools involved were Jackie Linney at Aldeburgh Primary and Saxmundham Primary, Sue Bruce at Clifford Road Primary and Hillside Community Primary Ipswich, Val Almstrong at Thomas Mills High School and Jenny Nutbeem at Springfield Junior Ipswich. Part of the ongoing Suffolk Craft Society John Jacob Young Makers’ Programme RAGS TO RICHES took place in the summer term of 2007 culminating in exhibitions at Leiston Long Shop Museum and Gallery 2, The Town Hall Galleries in Ipswich. Professional textile makers from the Society worked with teachers in Suffolk schools helping over 300 young people to experience the joy of craftwork and to develop their creative skills in the visual arts. One class learned how to knit impressive wallhangings using rags, sea shells and broom sticks. Another made 5m long wall hangings, while others made tabards, bowls and hats. The focus was on how to recycle otherwise discarded materials such as scraps of fabric, wool, plastic, buttons, tinfoil, even rope from Felixstowe beach, all gathered by children and their families. Over the course of the summer term these seemingly unpromising “rags” were transformed into an exciting variety of “riches”, including baskets and bowls, wall-hangings, tabards, hats and rugs. During the process, children practised a variety of skills, including screen printing, rope-making, even knitting on broom handles! Four makers, Jacky Linney, Jenny Nutbeem, Jo Rolfe and Anu Baldwin led the workshops working in textiles with the emphasis on recycled materials. The schools involved were Springfield Junior in Ipswich, Langer Primary in Felixstowe, Holton St Peter Community Primary, All Saints CEVA Primary in Laxfield and Beccles Middle School. The project was supported by the John Jacob Young Makers’ Programme, Friends of the Suffolk Craft Society and the Society. 2006 was the first year of an educational programme aimed at providing an opportunity for young people to experience the joy of craftwork, to develop their creative skills in the visual arts and to provide "hands-on" workshop experience with professional makers. A further aim was to encourage parents and other members of rural communities to develop their and their children's interest in craft and design. 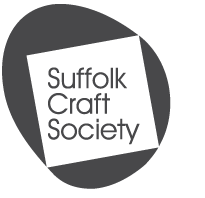 It is hoped that the 2006 programme will help to establish Suffolk Craft Society as an effective agency for providing creative craft programmes in schools and communities in Suffolk. In 2006 the theme of jewellery was chosen to complement Suffolk Craft Society's summer jewellery festival in which international jewellers exhibited alongside the Society's jewellers. There were two central ideas governing the focus of the young people's programme - first, that in creating beautiful, wearable objects out of otherwise discarded materials, children would learn more about the importance of recycling, and second, that the rich heritage of the locality could show children something of the continuity of the jeweller's craft and be an inspiration for artistic endeavour. Six of the Society's craftspeople were involved in residencies in schools and in adult workshops to create jewellery and relief panels. The armoury and jewels from the Sutton Hoo Anglo- Saxon burial ship and the industrial artefacts of the Long Shop engineering museum in Leiston were used as stimuli. The work culminated in a highly successful summer exhibition at the Long Shop Museum and at the prestigious venue of the Red House, Aldeburgh. Year 8 pupils from Leiston Middle School worked over a period of five weeks in the Long Shop Museum with resistant materials to create silver and semi-precious stone jewellery. The artefacts of the museum and the processes used in their creation were an integral part of the children's learning process. The young people responded well to being given expensive materials to work on and the results were exceedingly professional-looking. Parents joined in during after-school sessions. Years 5 and 6 children from Coldfair Green, Middleton and Peasenhall primary schools worked with recycled materials to make beautiful and imaginative jewellery and body adornment. The importance of minimising waste was emphasised throughout the five week residencies. Parents and grandparents joined in the activity during extended afternoon sessions. Years 5 and 6 children from Earl Soham and Charsfield Primary Schools visited the National Trust property at Sutton Hoo. Over a period of five weeks they learned to use various materials and techniques to create six large relief panels of Anglo-Saxon warriors and their wives adorned with jewelled armour and weapons. The results are so impressive that Sutton Hoo has asked to exhibit them. A Family Craft Day for children aged 5 to 10 and their parents was held in Framlingham, during which the theme of recycling was further developed. A two-day workshop for adults took place at Leiston Long Shop Museum in which paper jewellery was made and another two-day workshop in enamel jewellery was held at Framlingham Castle. The craftspeople involved were Jenny Nutbeem, Sarah Tait, Michel Cereso, Valerie Armstrong, Sheila McDonald and Alison Dane. The exhibition was designed by Jenny Nutbeem. Funding for the programme amounted to £12,500.00. This consisted of £5,000.00 from an Awards for All lottery grant, £2,000.00 from Suffolk Extended Schools Development fund, £2,000.00 from Suffolk Leading Edge fund, £1,000.00 from Suffolk Craft Society, £1,000.00 from the Friends of Suffolk Craft Society, £1,000.00 from the John Jacob bequest (given to the Society) and £500.00 from Suffolk Coastal District Council, which also paid for the publicity costs. Several local jewellers donated materials.